The Prize: This small needlecase is a premade item available with our Beach House line of fabric from Moda Fabrics. Mother's Day is just around the corner and time to celebrate. You don't have to be a mom to win this one though....you only have to like moms. Just send a response in the comments section of this post and you are registered to win. Entry deadline is May 9th. at midnight. Contest results will be posted on Sunday. Good luck to all!!!! Here is the winning sampler from our last contest. I love seeing this sampler in the blue shades. Brenda is from Canada....and her gifts should be arriving there soon. I send off all of the items to the first and second place winners on Monday. So for Misato in Japan.....yours might take a bit longer but your prize is on its way. "I just want to say thank you again, it means so much to me to be receiving gifts that came from my father's birthplace. My father was born in 1907 in a town called Wallers, Nord, which I have never been able to find on a map, maybe the name has been changed over the years. My father passed away over 30 years ago and to have vintage items from France with be very special to me. Here is my version of Petites Lettres Rouges, my favorite color is blue so I used DMC colors 823,312,3755. It is stitched on 28 count mushroom lugana, one over one. I am going to make it into a needle folder, so I stitched my initials into it." "I have stitched this sampler and dedicated to my mother, she died 15 years ago and she is everyday on my mind. I don't know the name of the linen fabric. It's light pink and it's probably 28 count. I used Gloriana colors Merry's Mauve and Fallen Leaves and au ver a soie nr 4645." Dianne Brown (click here for her blog) sent the above sampler and she writes. "Here is my version of your sampler. I stitched it with 35 ct. Old Grey Mare linen by Vikki Clayton, and the fiber is an unknown purple variegated also by Vikki Clayton. I used my great-grandmother's name, Merle Mandart, and her birth year of 1901. She loved lavender and she loved flowers, so that is how I finished this chart." "Here is my little Jessie Mason Sampler ... a token of remembrance of Aunt Jessie, a caring soul from my husband's side of the family. I thought an interesting connection to the theme of a French Sampler was that Aunt Jessie had a fondness for French-style furniture, some of which now graces our guest bedroom. This is where I hope to hang - or perch - the little sampler once it is framed. I can't wait! My sampler was stitched on 32 count over-dyed linen - labeled Park City Blend, but I'm not sure this is correct. I used Thread Gatherer Silk 'N Colors, 1 strand over 2, in the following colors ... the dark red is Crimson Woods, the medium is Worn Brick Path, and the light is Mayfair. The sweet bird motif is from The Counting Book by Little by Little." "I had such a fun time, and once I got started, I couldn't put it down. I love, love , love anything in red, so this was perfect for me. I stitched mine on 40 ct. Lakeside Linen in vintage Lt. Examplar, using Gloriana 100/3 silk in Poinsettia. I chose to add my Mother's name and birth date. She's been gone for almost 22 years, so it was wonderful to remember her while I was stitching. She loved birds more than anyone I've ever known, and passed that love down to me. I couldn't resist adding a second bird, one for her and one for me." I think my favorite feature of our first contest is seeing all of the samplers you have stitched. Family and even pet names have been stitched into the pieces of linen. These samplers celebrate yourself and those you hold dear. I will continue to post pictures and stories....neverfear! This is all I have to do to enter my name? I love your blog and have just started stitching your designs. I love them. Have a great Mothers Day. I love you blog and your designs. Please include me in the drawing. Thank you. Your needle case is lovely. Thanks for the chance to win one. Hi! Absolutely, count me in!!! Thanks! It's so much fun to see all the entries that were made to your French freebie contest! Thanks for another drawing! Hi Barb and Alma. I love the needlecase! You always manage to design such lovely things, and we are all grateful! Hope all is well. All of those finishes are beautiful. I hope you have a great Mother's Day! Hi Barb and Alma. For christmas I got my husband to buy your two latest books for me and I absolutely love your materials and have found your blog only receently. Please enter me into the needlebook contest. How lovely! Please enter me in the drawing - what a sweet piece to win. Hello from CA. I just found your blog and will bookmark it to check in often. Please put me in the drawing for the needlecase. Happy Mother's Day to all you ladies. This is a message for Brenda, your petites lettres rouges winner. What a gorgeous, gorgeous needlecase! And of course I love my Mom, and my Mother-in-Law, and all of my grandmothers! I come from a long line of sewers and stitchers and am grateful that I appreciate these things because of them! I love looking at everyones samplers and the stories of ancestors that go with them. They are all absolutely beautiful. Thanks for sharing. The needlecase is beautiful, as are all of your designs. I love your blog. I have told my historic stitching guild all about finding you. We are all big Blackbird design fans. You really inspire me. Thanks for taking this type of media outreach. Rebecca in Waterloo, Ia. I forgot to officially tell you to count me in the drawing, I would be honored to win the needle case. Hi Barb and Alma. I would love to be included in the drawing for the needlecase. I'm so thrilled to have your blog to follow as I love all your designs and can't wait to see the next offering. I'd love to win the needlecase, too!! Thanks for all the wonderful designs & keep them coming!! I'm all for contests. I love your blog, love your designs and am constantly inspired by what you do. Happy Mothersday to you both! first of all, I received my second place prize today! It looks like a fun stitch!!! Thank you so much! Second, I would love a chance at the Mother's Day prize. What a way to honor a mom! Thanks much & happy Mother's Day! Hello Alma & Barb! Thank you for offering a Mother's Day draw. 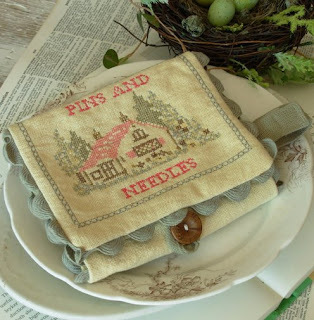 Your needlecase is lovely - another little treasure from Blackbird Designs. Happy Mother's Day! I would so love to be entered in your drawing.. Your blog is so special to me, I look forward to your posts. thank you so much for offering this beautiful needlecase. Please enter my name in the contest. I would be thrilled to win your needlecase! I am a mother and now (as of Sept. 08) a grandmother. I never thought anything would be better than being a mother to my 2 daughters but this grandmother thing is awesome. I have very happy memories of my own mother who has been gone 20 years this year. Please enter me in your contest. Thank you! Happy Mother's Day. I would love to win your needlecase. Please enter me in the contest. I am loving this blog! 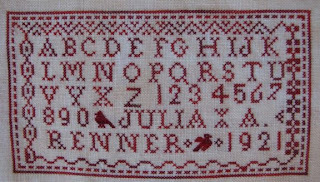 It is so fun to see all the variations on the sampler that you offered too. I would love to be entered for the needlebook. Happy Mother's Day! I'm not a mom, but I have an 88 year old one. Please include me in the drawing. I just LOVE the needlecase! Your designs are just the greatest. I would love to be entered into your drawing. Thanks for the chance. Yay! Another contest!! Please enter my name. Thanks! While I am not a biological mom, I am a substitute Mom. I help raise a niece and nephew and have been a home child care provider for 14 years. I have been "temporary mom" to over 50 children :) And I take care of my Mom who lives with us now! and the needlecase is beautiful. Alma & Barb: Love your blog. Unfotunately, I was away and saw the sampler contest too late to enter. I still plan to stitch it though, and it's great fun to see how other people stitched this sweet little sampler. The needlecase it just gorgeous, please count me in. I love being a mom and grandmom. I love my mom and mother-in-law. Have a beautiful Mother's day!!! I love your designs and your blog. Please enter me in your new contest. I had so much fun stitching "Petites Lettres Rouges". Even though I didn't win a prize, I felt like I did. Before finishing "Petites Lettres Rouges" I was going through a very long stitching slump. Now I am stitching again thanks to your first contest. I would love to be included for the drawing and would even more to win. Thanks for doing this......love your blog! I am so glad you have a blog so we can keep up with all the great things going on at Blackbird Designs! Count me in! I love reading your blog. And what a lovely prize you are offering. I would love to be included in your drawing/contest. This will be my first Mother's Day without my Mom. She passed away on Dec. 6th. I know I will be having a rough time of it come Sunday. Heck I am. You see my Mom was my best friend and I miss her deeply. ...breakfast in bed... some flowers...and a nice drawing from my son..I hope :o)... and a phonecall to my MUM!!! Simple things but given with the heart is so much fun!! Oh my gosh what a lovely array of wonderful samplers. So much fun to see the stitching and read the stories. What would we do without our needlework? Thanks for another drawing to highlight Mother's Day! I just love your blog. So fun to read of your adventures and see your wonderful designs. I would love a chance to win the needlecase. I wish both of you a Happy Mother's Day. Hi, I love all your designs and love reading your blog. Would love to win this adorable needlecase,please enter my name. Thank you ladies for the lovely contest. Please enter my name in your drawing! How nice of you to offer this! Happy Mother's Day to you both. Thank you for this chance - I missed the last contest by a smidge. I love the needlecase. I lost my Mum 18 months ago, but celebrate Mothers Day by setting my dinner table with as much of her/my pink glass as possible - it looks so nice. This mothers day we are celebrating my Neice's 18th and Hubby's birthdays again - so it's never so special for me - but with my boys - every day is Mother's Day! Loving this BLOG!!! Please enter my name to win!! I would love to be entered to win the lovely needlecase. Your desings and blog are inspiring! Have a Happy Mother's Day. What a lovely needlebook! Please add my name to your drawing. Thank you! Oh my another wonderful contest!I LOVE Love your desings so please enter my name in this drawing. Love your blog and seeing more PLR samplers. Imagine all of us stitching on it at the same time! Where can I get your fabrics and accessories in the UK? It's great, another contest. Please, can I join it?Thank you. Alma and Barb - Your blog is so much fun to read, one of the few I actually read! You always have such lovely things and I would love to win the needle case! Love that needlecase, will Moda be selling them? thanks for sharing the samplers with us, they all did a great job. Everyone's samplers are wonderful! Thank you for sharing and have a happy Mother's Day! Thanks so much for offering another drawing - the needlecase is beautiful just like your designs - which is why they are so hard to resist and why I have a drawer full of them waiting to be stitched, two waiting to be framed and another gracing my living room wall - The Strawberry Garden. Barb & Alma, Love your blog and can't wait to start stitching the little sampler. The needlecase is delicious; what a great Mother's Day "gift"; thanks for the chance to win! Have a great Mother's Day. I love your blog and all your patterns. I, too, was unable to stitch the sampler since I've been taking care of my mom as she recovers from hip replacement surgery, but you can bet your booties I've got it kitted to stitch very soon! I think I'll put my great aunt Harriet's name in there. She died when she was 5 years old in 1918 and so that will the year I'll use. I love the needlecase and would love to have a chance to win it! Love your blog and your designs. Just started to make the quilt with the baskets. This needlecase is also very sweet. I absolutely loved the first contest. Everyone who completed the sampler was a winner--they have a finished piece of needlework to show for it. :) Please enter me in this contest as well. :) Thank you for the opportunity. Happy Mother's Day! I'm still stitching away on my Petit Lettres Rouges. I have to say, it's been a real delight, even if I didn't finish it by the deadline! I love all of your designs, and I'm completely addicted to your fabrics from Moda!! Hi Alma & Barb! I love your designs...only the time I need!! Please enter me in the needlecase. 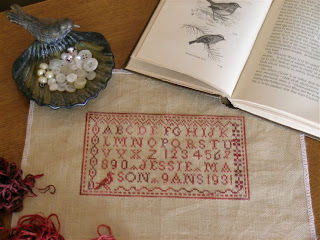 I enjoy this blog and I want to get my own sampler stitched. I would love a chance to win your needlecase. Good to read you're save home. Who wouldn't like to win this needlecase. It wil be a perfect match with the pincushon which you tought us in France! Happy Mother's Day to both of you. I am so happy I found your blog. Very inspirational! Hi Alma & Barb, I do love all your designs and I would love to be included in the draw for this darling needlecase. Thank you. I so enjoy your blog. The needlecase is so cute. Please enter me in your drawing. What a lovely needlecase! I would love to have my name entered into your contest please! What talented ladies! Gorgeous work. I am envious :) I enjoy your blog so much. Your blog rocks! I just love your designs and all the little extras! I would love to be entered in the contest! Happy Mother's Day! Happy Mother's Day! It's great to see so many versons of the same sampler. I would love to win the needlebook, please enter my name. Love all your designs. Thanks for hosting this contest and Happy Mothers' Day to you! What a great (and really sweet of you) giveaway! I would love to be entered - My son, Matt turns 18 on the 9th and once in a while his b-day falls on Mother's Day - I love that! I called a bit earlier and you had 21 comments after watching a DVD you have 85 comments WOW !! I love Mums - especially my own :) and I hope the move has gone well for your own Mom !? I am extremely new to the blogging world. Not quite sure how to even start, however, I am not new to your designs! I love them. I would love to enter your needlecase contest! I know you both had such a good time in France. All of the fantastic items you brought back!! I would love to have the Beach House needlecase. Happy Mother's Day. It's lovely to see all the different PLR samplers! I would love to win the wonderful needlecase so please enter me in the drawing. Beautiful needlecase and what another generous contest/giveaway! thank you for the chance at winning. I love your blog and your designs. Oh,my gosh! I drool everytime I see the entrys from the contest. I don't stitch fast enough to have entered, but, would love to enter this contest. I enjoy your designs & it is great to follow your blog, too! I love your designs, and I would love to enter in your draw for this beautiful needlecase. Your blog is all the things I love, Moda, samplers, cross stitch, sewing, quilting, Mothers and antiques. Thank you so much for sharing your talents. I would love to win this needlebook. I love your blog and love seeing all the pretty versions of your sampler. Your needlecase would make a wonderful Mother's Day gift. Oh fingers crossed I win this needlecase! Beautiful finishes of your freebie! What are those little red samplers (and one blue) beautiful! yes it really was fun stitching it. Please enter my name in the contest. Thank you! Hi, I love that needle case. I would love to have it. Thank you for your generosity! What a fun giveaway - absolutely beautiful! thank you for your wonderful designs, please include me in the drawing. What a lovely needlecase! Please include me in your drawing. I love reading your blog and seeing upsoming designs and finishing ideas. Thanks for sharing more samplers from your contest. They are all so pretty! The little needlecase is wonderful. Please enter my name in your contest. All your designs are wonderful! I'd be thrilled to win the needlecase. I enjoy seeing all the different finishes of your sampler. I hope to finish mine soon,too. How nice of you to have another contest. Please enter my name,too. Ahhhhhh, the coveted needlecase, whether new or old they are always lovely and yet we are so frightened to actually try to finish one-LOL:) Thx for the chance, it's lovely. Have great fun with your contest and Happy Mothers Day! I'm feeling lucky - please enter me in the contest for the needlecase. What a wonderful gift. Please enter my name in the drawing as well. just found your blog and i'm inspired....and i love the little needlecase! happy mother's day!! This is such a fun all around site, you've got cross stitch, quilting all in one!!! What a beautiful needlecase. I would love to win it! I too would love to be entered in the contest,such a beautiful needlecase. Hi Alma and Barb, your blog is also so inspiring. I absolutely adore that little needlecase, it is so sweet. Happy mothers day all. Your pictures are inspiring! I really enjoy seeing all the different versions of the samplers. Such individuality! Your needlebook is wonderful too. Enjoy your blog. Please enter me in your contest. Happy Mothers day. Hi! Please count me in on the drawing. It's fabulous seeing how everyone stitched their Petites Lettres samplers! Thanks for sharing them. Please enter me in your drawing. The needle case is really special. I do enjoy your blog. I love the needlecase and hope I win it!!! I also have enjoyed all the little samplers. Such talented people! I enjoy your blog, especially the inspiring stitching you show us. Please include me in the drawing for the needlecase. What a treat that would be. I would love to be entered in your giveaway. Please enter my name. Your blog is fabulous! Happy Mother's Day to you both and thank you for the beautiful designs that I love to stitch! I have enjoyed seeing all the creations, others have made from your designs. The needle book is beautiful, someone will be a lucky winner. I am so glad that you started blogging! I just love reading your posts. Please enter me in your give away, I think the little needlecase is darling! Happy Mother's Day! Thank you so much for the opportunity to leave a comment to go in the draw for that divine needlecase.I so adore all of your work both patchwork and cross stitch. I am now 65 years old, my Mother died when I was 17, but I still think of & miss her every day. She would have loved that I finally had the attention span to enjoy stitching & actually finish something! Your needlecase is lovely! Please enter my name in the contest. Such a beautiful giveaway! I love your blog and just recently found it during the sampler challenge, however a tad late to make up a sampler in time, but maybe I can join a future challenge. In the meantime I'm enjoying all of the wonderful inspiration. Thank you! Barb and Alma. Thank you for always posting such lovely posts. I just love your blog. Please enter my name as well. I like Mums! The needlecase is beautiful, and I would love to be in the draw please. Thanks. It's a fabulous needlecase! I would love to be entered in the drawing, too! Thanks for the chance to win your gorgeous needle case. I love your designs & blog! It's great to see some more of the competition entries. I would love to have a chance of winning the needlecase, so please enter my name in the draw. The samplers are lovely! Please enter me for the draw of the needlecase - I love cottages. I just discover your blog. Have a gret Mother Day. I found your blog not long ago and absolutely love it. I just had this needlecase sent to a very special mother in Texas, my dear friend Denise. She absolutely loved it. I guess I should have gotten one for my own mom too :), but who knows, maybe this contest will take care of that. Hi Barb & Alma!I realy crazy about your designs! Please enter my name! I love your blog, and thanks for sharing pics of the samplers! Mothers day is poopy now that I dont have mum, but I'll be spending the day putting binding on a quilt made in her honour! PS Happy Mothers day to you! Organising devonshire tea for my Mum on Sunday. Love the little needlecase, and by the way, am now stitching my second sampler! Thank you for organising another draw and please enter my name ! We were talking about you with the ladies at needleework shop in the Rue Chabanais ! This is such a pretty needlecase! I would love to be entered in the drawing. I am not a mom and absolutely LOVE and adore my mom! She is a great lady and also a friend to me. It is her encouragement along with my father's that brought me to love needlework and history. She swore she would never start stitching and guess what? At age 70, she has started. Isn't that fun! A Very Happy Mother's Day to You Both...Thankyou for a Lovely Giveaway..a Treasured Keepsake. I am not a mother but love my mother. She has selflessly made pancakes for 100's of people on Mother's day and has taken her first Mother's day off in ages. I get to celebrate with her. Mom and Dad drove 4hours to be with me last night. Mom and I are celebrating by going to 2 quilt shows one in Niagara Falls Ontario and the other in Peterborough ON. What a perfect way to celebrate. I hope you can celebrate too.. thanks for the great blog and the wonderful giveaways. The samplers are wonderful and great to see that they also had so much meaning. Sorry this is long. The needlecase is so gorgeous, I'd love to go in the draw, it's mother's day this Sunday for us. I am really enjoying your beautiful blog. All the different versions of this lovely little sampler are lovely. Please enter my name for the needlebook. Sandra in Australia. That needlecase is beautiful, thank you for letting me have chance to win it. I loved this contest, and I enjoy seeing the entries; thanks for sharing them. I wish I had done my sampler on linen, but I knew I would stitch faster on evenweave. Oh well, there's always time to stitch - I'll just have to make another one. I would like to wish you happy Mother's Day, too! I would like to win this nice needlecase, please enter me! I have enjoyed seeing all the different finishes of your little alphabet sampler and how different each one looks. Oh, please count me in for your lovely drawing - and thank you for organizing it (especially so soon after the last wonderful contest). Thanks! The entries for your sampler contest are just stunning - it's amazing how diverse such a simple pattern can become with some creativity. Thanks for offering the lovely needlecase as a prize for the new contest - I'd love to be entered in the draw please. I look forward to each of your posts to your blog. The needlecase is so pretty! Please enter my name for a chance to win. What a great blog and gorgeous needlecase. Please include me in your draw. 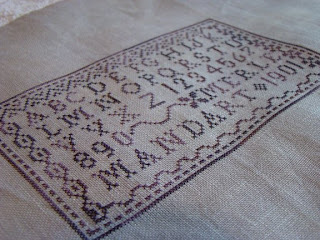 I am not sure why, but it never occured to me to put my Mothers name on a sampler. I have stitched her many things over the years but have never put her name on them....Now I will and I thank you for pulling me out of my revery. Barb and Alma, what a beautiful case! I would love to own it. I admire your wonderful quilt and sampler patterns. I have stitched many of both. Wishing you a wonderful Mother's Day. I love be be on your blog and I do like the needlecase very much ! Hello, I never enter a contest like these before. You are very nice for doing this. I love contests, your designs and prizes! Hope you both have a great Mother's Day! I love contests, prizes, and your designs! Hope you both have a Happy Mother's Day! Thank you for offering such a nice gift! Hope I win ;-). Love all the different pieces, it's so fun to see the colors and extras everyone added. I'm so glad that you started this blog! I would love to win the needlecase! Hope you have a great Mother's Day. everything comes from you is stunning. thank you again for this new contest. Oh wow! Thank you so much for featuring my sampler on your site! I'd love an opportunity to win that needlecase! It will look great with my Beach House fabric that is in my sewing room right now! Happy mother's day (early) to you both! I really enjoyed participating in your last contest. I'd love to win this sweet needlecase. Crossing my fingers! Hi There Alma & Barb!!!! Oh how I love that needlecase!!!! It so matches the vintage samplers that I've collected over the years that I have hanging on my walls!!! What a GREAT Mom's Day gift that would be to win!!!!! Win or Lose,I thank you for the chance!!!!! Oh my goodness that needlecase is beautiful. Please enter my name (and thanks so much for having the contest)! Hola Alma & Barbara I really like your blog, designs (cross stitch, fabrics, etc,etc. )I´ve heard your class in Nantes was great for those lucky ones who had the opportunity to be there. So different samplers and all of them with so different stories. It's a pleasure to see and read them. I like mothersday. I'm a mother of two adoption children. I love your blog, please enter me for the needlebook. I love your blog. It is inspiring to me everytime I look at it. The needlecase is beautiful Thank you forthe opportunity to win. Happy Mother's Day. thanks for having this wonderful blog....and happy Mother's Day....if you're like me I was so lucky to have a wonderful mom that I miss so much.....hope that I am half as good a person than she was. I just found your blog recently and I truly enjoy reading your words and looking at the beautiful stitching done by so many. Please enroll me in the drawing for the needlecase. a very good day for you both on the 10 of May full of Love and perhaps samplers! You can enter my name for this exquisite needle case:(it's my 61 Spring on the 9 of May) but passion for BBD cross stitch and patch keep young! thanks. I meet you both in SMM Alsace. It's such fun to see all the different versions of the little sampler! I adore your patterns and your blog has quickly become one of my faves! My chances are so slim for winning this lovely needlecase, but I really have to have my name in there too! Thanks for the chance!!! Mother's Day ( or Mothering Sunday as it is called here) is the Sunday 2 weeks before Easter in the UK, so I have already been blessed with handmade cards and some beautiful flowers from my two children. But I would not say no to the chance to receive your needlebook! Thank you for your lovely blog, ( and designs and fabrics!) which I enjoy very much.